You might have already heard of cat bearding, the fun new trend of taking photos with a cat held up to your face to appear as a beard. The trend started when a photo of a cat looking like a beard on someone’s face was posted online. Others started taking similar photos and the idea went viral. Collective Bias and Fresh Step want to see your best cat bearding photos. By sharing your most creative and original cat bearding photo, you could win a professional photo shoot for you and your cat and an entire year’s worth of kitty litter. Having a happy cat just might be the key to taking a great cat bearding photo. Did you know Fresh Step’s new formula improves odor control by adding chlorophyll and essential oils to the formula? I know that Cali would love a clean smelling litter box. So grab your cat, don a beard and take some photos!! Share your favorite cat bearding photo for a chance to win! 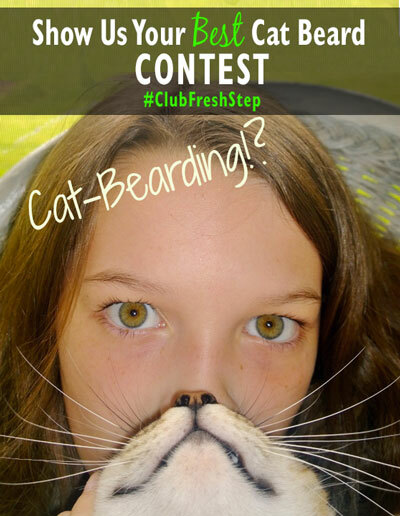 Share your best cat bearding photo on Instagram and include “#ClubFreshStep” in the caption or Tweet a photo using the “#ClubFreshStep” hashtag.. Submit your Instagram photo link or tweet url to the linky at the bottom of this post. Your Instagram account must be non-private. Photo caption and tweets must include “#ClubFreshStep” and cannot exceed 100 characters. Photo(s) should only include contestant and cat. Each Contestant is limited to 15 photo entries. Contest is open to residents of the US, District of Columbia, and Puerto Rico that are at least 18 years old at the time of entry. Live dates of the contest are September 16-30, 2013. Please read complete contest official rules prior to submission for eligibility and requirements. Each entry will be scored by judges based on 40% creativity, 40% originality, and 20% relevance to the cat bearding theme. The entry with the highest score will be deemed the winner. In the event of a tie, the winner with the highest creativity score will win. Winner will receive a professional photo shoot for contestant and his/her cat and a one year supply of kitty litter. Winner must agree to allow sponsor use of photos for potential publication. Kitty litter prize is redeemable in the form of a $700 Sam’s Club gift card. Approximate retail prize value is $1,000 and winner is responsible for all applicable tax associated with the prize. Go get your cat and camera to enter the Instagram/Twitter photo contest today! Submissions on the linky below are considered official entries and will be verified at time winner is selected. Entries accepted September 16-30, 2013. Previous articleThese Beautifully Handcrafted Phone Cases Will Make Mom Jealous! Next articleWhat Are Your Favorite Go-To Products In Your Home?